Martin Short’s Rollcentre Racing squad loves a challenge and seems to relish the prospect of introducing new cars to racing with all the developmental challenges that this entails – from the TVR Cerbera, through the early TVR Tuscan R and the first Moslers and Noble to run in European GT racing and now, in 2006, as the first customers for the Radical SR9 which is picking up fans and customers on the back of some storming performances from the men from St Ives. “Testing went reasonably well for us, but we seemed to struggle with traction, and a too high first gear which hurt our acceleration out of the ridiculous amount of low speed corners (I for one will be a happy bunny to never see Jarama again.....). 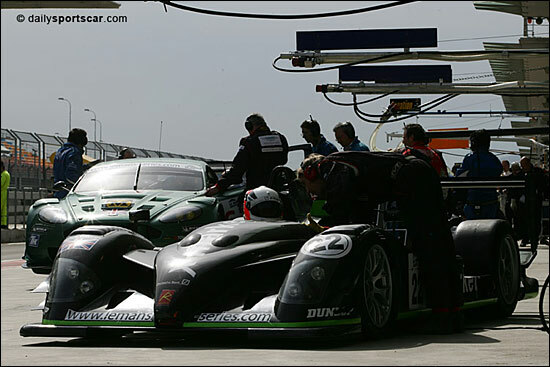 “It definitely wasn't a Prototype circuit, and when I went out to watch trackside, it was criminal to see the Pescarolo and other big LMP1 cars struggling to get round, rather like watching adults on a kiddies slide, still getting to the bottom at the same speed, but all looking rather ungainly, with both cheeks hanging over the sides! “Warm up went really well, Joao banged in a lap on full tanks, and old tyres quicker than he qualified, on his second lap. Rob did a good time and mine wasn't too shabby either. We had made a diff change for warm up and the car was transformed. Our dander was up for this. “However, I had decided that for this race, it was going to be Barbosa and Barff to drive, I would only get in at the end if we were basically assured a win. It was win or nothing.....and nothing it was to be again! “The race started badly for us, within a lap Joao was in with a flat right rear. We quickly changed it and got him out just in front of the leaders, but dead last (bar the Lavaggi....)....the lead LMP1s went by, and Joao settled down 10 seconds in front of the lead Lolas of initially Tommy, and then the ‘Spanugese team’ (ASM). Joao steadily stretched our 'lead' over the leaders by another 10 seconds by the end of his stint. “The leaders pitted, and they all had tyres. We came in 4 or 5 laps later (thank you Judd for wonderful fuel consumption) and left the boots on (thank you Dunlop for terrific rubber!!!!). We immediately gained another 30 seconds on the leaders, and by now we were back up to third, 30 seconds or so behind. 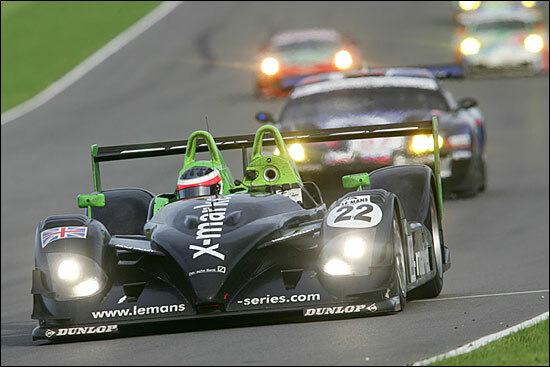 And we continued to gain, on old or new rubber: the Radical SR9 was terrific. “Then.....out came the safety car. I was stood on the wall, and saw the Porsche in the barrier. I watched and waited, after having briefed the team, and out came the comedy safety car. We brought Joao in, fuelled him and booted him, and got him back out before the safety car came into view with the crocodile behind for the first time. We were then 20 seconds behind the two leaders, full of fuel, with new boots, and with them requiring the same in about 20 laps.....marvellous! “So they both pitted, and bingo, we were 1 lap and 20 seconds in the lead and on schedule with our pitstops to finish perfectly, from dead last, (again ...Nurburgring....). It felt bloody good...... But Joao had been twatted by an Aston who wanted to be where Joao was....the Aston spun, we carried on, but the splitter was damaged, along with the front cover. We got Lordy to photograph it so we could have a good look at what we needed to do. We decided that tape would probably do it, but as we had a lead, and there were still three and a half hours to go, we would change both components at the driver change. “After two and a half hours in the car, Joao was pretty tired, but he did a magnificent job for us, and pit stop time came, Joao out, Rob in. I had told Rob to be careful, as we had no more splitters.....we changed the components, and did the full stop in 2 minutes, which would have hurt us a bit, but we wouldn’t find out by how much as the radio lit up with Rob saying he had had a crash on his out lap. “Needless to say, I was not in the best of moods. Rob continued, but now we were 5 laps down, and stuffed. As it happens, if we had finished, it would probably have been second, but fate stepped in again to give us a final kicking. The engine stopped, for reasons as yet unknown (we haven’t stripped the car yet) but it wouldn’t be coaxed into life, despite seeing oil and fuel pressure and electrics on the telemetry. “We must have led a ridiculous amount of laps, and came so close to wins, but lady luck was not only not with us, she had passed a 'condemned' notice on us. Still, we always had the sun in Spain to enjoy......errr....no.....there wasn't any of that either. “So 2006 ends for us, with many so nears, and yet so fars. A bloody fast car, some stirring performances and raised eyebrows throughout the year, no Cigars, and too many times hearing the fat lady sing in the wrong place. “Discovering I was third quickest overall at Istanbul in 5 laps, 40 minutes into a delayed (for us) session and hitting the WHAT!!! button on the steering wheel. “Joao, back of the grid at Istanbul after blipper problem, to 4th overall, nearly passing the lead Pescarolo in the damp/drying conditions, setting fastest race laps, outright, of the field.....then 10 minutes to go, wiring loom chafed and burned out, from a podium position. 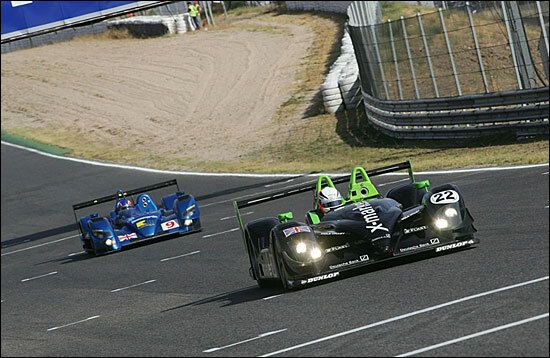 “Le Mans, leading the class.......not finishing on the podium. “Joao, from deal last again on the grid.....Nurburgring, hounding down the Spanugese Lola from 15 seconds behind, the pair of them setting personal fastest lap after lap, until Joao could see the whites of his eyes.....and then going for it in the most outrageously amazing move down the inside of a shell shocked TVR, and it all ending in tears for us as Joao was mercilessly speared off by the deposed leader.....15 minutes to go......a third would be a poor reward. “Donington, a great pit as the safety car went out, putting a lap on the LMP2 field, and then putting almost another lap on the RML car to go into a 3 lap lead.....then the 12 minute to go curse.....lost 6 teeth off the ring gear and car wouldn't start. “Jarama, Joao driving out of his skin for two and a half hours, from last again, to a 1 lap lead.............and then crashed and stopped....... Still at least it wasn't 15 minutes or less from the start, so the beer tasted better, and was earlier after a quick pack up. “It’s been a character building year, with a sensational race car. Lots of time and development, lots of highs and lows. We’ll be finding out soon here on dsc!